Reclaim your inner happiness with a new lifestyle. Yesterday in my Reinventing The News Class, we heard from NewsTrust editor and reviewer, Mike LaBonte about his experience with the website. NewsTrust allows users to upload stories they wrote, which are then rated based on news quality rather than popularity unlike websites such as Digg.com. LaBonte said that NewsTrust loves partnerships with media organizations and schools. 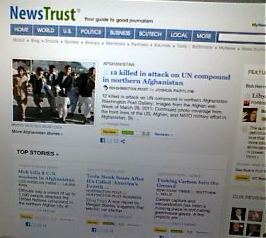 They often cross link one another for a week or so, and NewsTrust has a widget that can be added to sidebars. There are both amateurs and professionals writing and reviewing for the website. LaBonte explained that the more a person reviews, the quicker they become a professional. On the main page of the website, top stories have a rating system based on the score readers gave it. Once you click on a story, you have the option to give the story a short rating, quick rating, full rating, or advanced rating. For a short rating you are asked three questions: 1) Is it factual? 2) Is it fair? 3) Do you recommend it?. If you have enough time on your hands, you can give an advanced rating or anything in between. I was interested in exploring the website further, so I decided to rate 5 stories and use the full rating system for each. The first story I rated was from the New Republic titled “The End of Compassion” by Jonathan Cohn. He talked about funding for health programs abroad and community clinics in his lead, but he didn’t describe the current situation. He focused primarily on what George W. Bush did during his presidency. Therefore, I rated the quality of his work on a scale from 1 to 5 with 5 being very good and 1 being not so good. For example, I gave him a rating of a 2 for both relevance and information since it lacked both. Unknowingly, I came across another one of Jonathan Cohn’s articles from the New Republic titled “Medicaid in the Crosshairs”. It was much better than the first article I read, but he used an anonymous GOP source. I commented on the article and said that I wish he would have given a better explanation as to why the source is anonymous. I gave him higher ratings for areas such as context, information, and relevance. The next story I rated was from CNN by Amanda Gardner called “U.S Has Highest Bipolar Rate in 11-Nation Study”. It didn’t give the name of the study until the third paragraph. All of her information seemed very factual, but I wish she gave more information on what the study tested and how it did so. I gave her a 4 for facts and a 3 for depth since she didn’t explain that much about the study. I posted two stories to NewsTrust from the Boston Herald’s website and rated them. The first story I chose was by the Associated Press titled “Phil Mickelson Tries To Spread News About Arthritis.” The sources seemed credible because a doctor was interviewed, and it was informative. It is also relevant, because fans are interested in Mickelson’s well-being and performance. The next article was also by the Associated Press titled “FDA Proposes Calorie Counts On Menus.” I rated this article a 4.2, because it had many journalistic qualities. It discussed the proposed solution for obesity in the U.S. in detail and was very insightful. It was also original and well thought out. People can learn about the proposed law and have a full understanding from this article. I enjoyed my rating exercise, because I’m much more knowledgeable with the site and now I can hopefully use it as a resource for my blog posts. I enjoy how users can rate journalists and weed out poor journalism. Click on my user page to see all of the ratings I’ve given and for more information. This entry was posted in Health Resources and tagged Amanda Gardner, CNN, jonathan cohn, mike labonte, new republic, newstrust, weekly dig. Bookmark the permalink. Thanks for your great review, Brianna. We’re glad you find NewsTrust useful. Keep the feedback coming! We’d love your suggestions.